Before I jump into it today, I want to share a few thoughts I sent to Breakout Profits subscribers last week — on the topic of profiting from lower markets. I did not ask for the market to fall. It’s not up to me and I don’t get any say in the matter. These are just the cards that we’ve been dealt. Some of you have known me for over a decade and have seen me bullishly pound the table, and also get out of the way when the evidence presents itself. Cash is an option. Shorting stocks is another. But it does not make a lot of sense to me to be erring on the long side of stocks right now. The whole point of the 7X Cipher is to position ourselves only when the risk versus reward is incredibly skewed in our favor. Nothing in this market is currently suggesting that the risk versus reward right now is in our favor if we’re buying stocks. It’s as simple as that. I hope you understand where I’m coming from. We can’t play the cards we want, we have to play the ones we’re dealt. All that said, those were the paragraphs that ended my latest trade alert. There’s still ways to make money in this regime, and I won’t stop sending recommendations, but don’t forget that cash is an option. We look at markets globally because that’s what they are: global markets. The weakness in stocks worldwide throughout the first couple of quarters this year was a heads up that something was wrong. We did not see the rotation come in, like we had seen so consistently after any sector went through a period of underperformance. Rotation is the lifeblood of a bull market. Money did not flow back into foreign markets, and as it turns out, the U.S. was the last man standing. The chart below tells the story of exactly what took place. 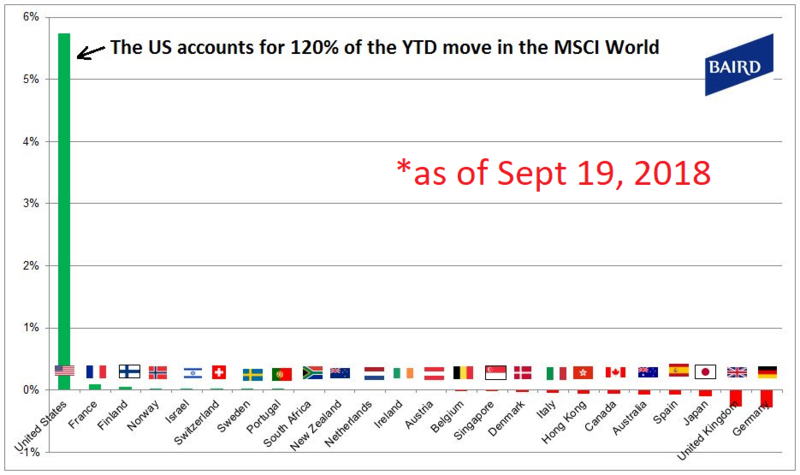 It comes from Michael Antonelli of Baird and shows the year-to-date return of the MSCI World index, broken down by country. The United States was obnoxiously the last man standing. So we did not get that rotation and other markets have led us lower. The underperformance of Germany and the UK as the worst of these developed markets suggests relative weakness compared to the rest. So, that’s the area we’ll look for to either a bottom and rotation, or continued drag down of American stocks. Here’s Germany. Would you say this is a major top? Or a major bottom? I see momentum in a bearish range. Prices are making lower lows and lower highs below a downward sloping 200-day moving average. 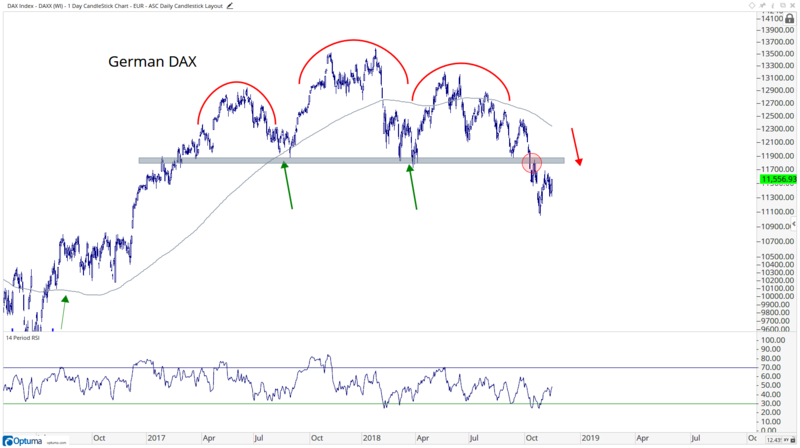 The German DAX has broken below support from 2017, and earlier this year, and has remained below it for over a month. In my experience, I don’t consider any of these characteristics of uptrends. Germany has been a great leading indicator in the past. We often see Germany rolling over prior to U.S. markets getting hit. Here’s a good example from the 2015 top. 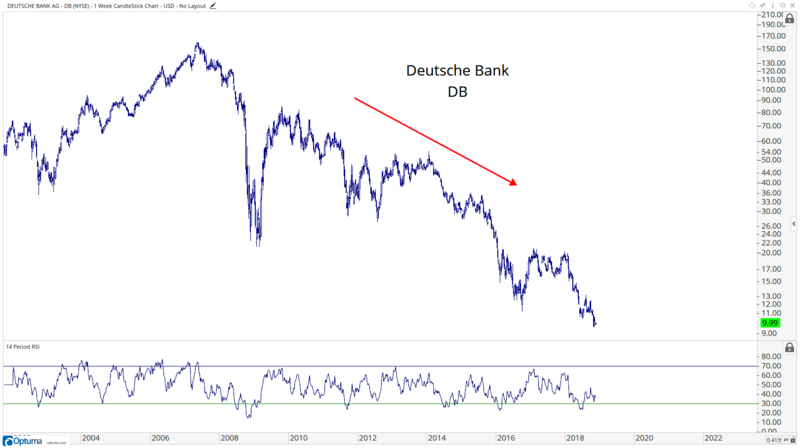 Germany peaked and started rolling over well in advance of the U.S.
You could go back further and see similar weakness in Germany prior to the tech bubble top in 2000 and prior to the 2007 financial crisis. 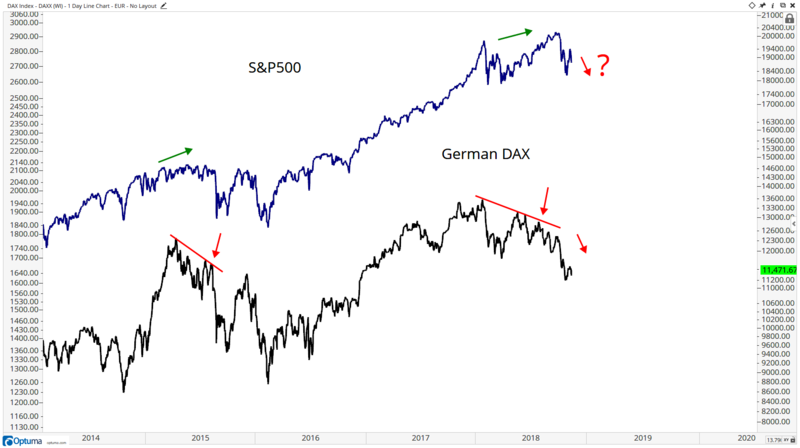 These are just two recent examples of German weakness leading the way lower. Ultimately, I would argue the United States catches down to them, not the other way around. We’re not seeing any evidence at all that a selloff is over in Germany, or Europe in general. Does what you see below in Europe look like a major top starting at a logical level? There’s clearly resistance here. It failed in 2015, it failed in 2007 and before that in 2000. Why should this be any different? 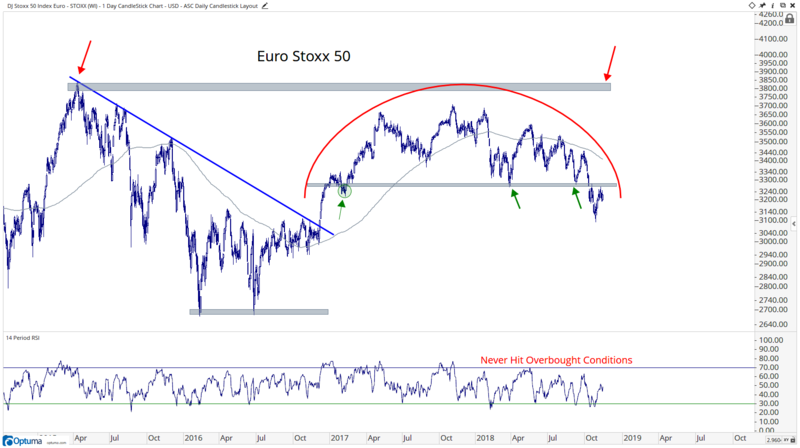 As long as Europe is below the lows from the past two years, we have to err on the bearish side. I can’t think of any reason not to. 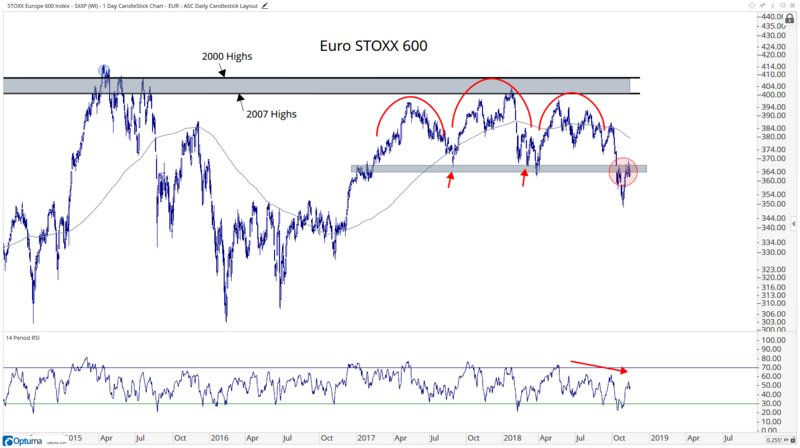 We are seeing similar behavior in the Euro Stoxx 50, which includes just 10% of the components. I think of it like this is Europe’s Dow and the chart up above as their S&P 500. Every bear market has its leadership group. We say the same about bull markets. 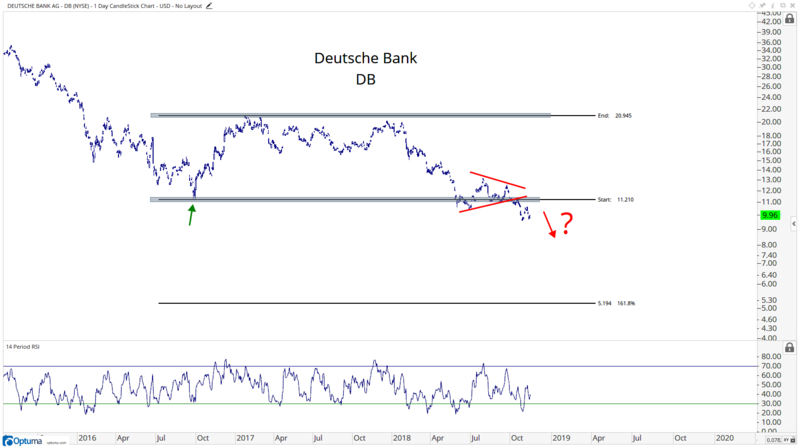 Back in 2015 a big part of our bearish thesis was the disaster in European banks, particularly Deutsche Bank (NYSE: DB). When they bottomed in summer 2016, it was a green light to load the boat in equities, U.S. or otherwise. The downside risk was no longer there. I’m going to go with the first one, and if we’re below those former lows, how can we not err on the downside? The risk here to me is lower, much lower. 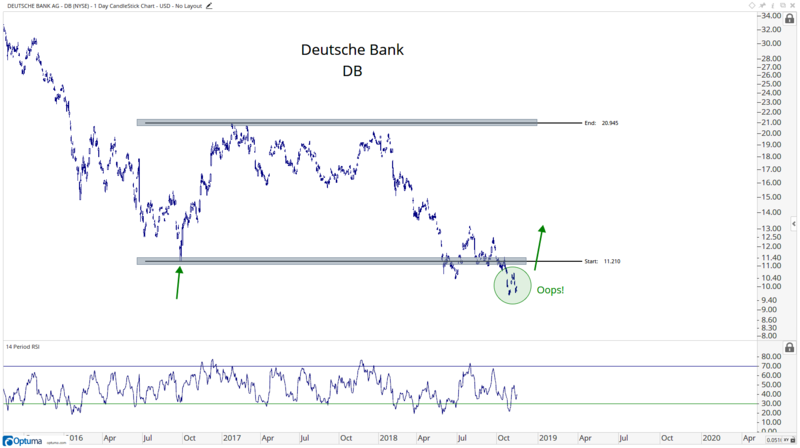 The bet we want to be making here is not that European banks are going to recover and lead a massive mean reversion higher. I think it’s the opposite. This does not help the bull case for me in U.S. stocks. The way we see it, this is just another piece of the puzzle suggesting the risk here in stocks is to the downside. So, that’s why I felt it important this week to reiterate my stance on high cash positions. I’ve been very clear about that since early October. If that’s an option, I still really like it as a portfolio strategy.